As a Physical Therapist, I treat a lot of people who enjoy golfing, but feel limited due pain in their back, hip, knees or feet. During their evaluation, I always perform a gait analysis and review their footwear for proper support. Inevitably, I get questions about the best shoes or inserts for joint pain, so in my search for options, I found a unique golf insole that is gaining traction among pros and amateur golfers. Of course, there’s no substitution for a thorough PT evaluation, but hopefully you find some value in this review as you decide between the best insoles for golf shoes. Before trying these new insoles, I didn’t realize how much my current golf shoes were lacking in terms of support and stability. The original insert in my golf shoes included a thin pad of material that was equal height across the entire insole. That doesn’t make sense because obviously your foot has a contour and unless your shoe itself contours to your foot or you have an insole that does the job, you’re not going to get this support from a quarter inch flat foam insole. In my original golf shoes with the original inserts felt like it was very easy to rock back on the squishy material of the quarter inch insert. While it wasn’t much, did have enough give that it made me feel a little bit unsteady compared to having the shoe on with inserts. I was able to see the difference by wearing one shoe with the ALINE golf insert in the other shoe with the original insert, and it was a surprising difference. One of the tests that like to do in the clinic when working with golfers or other athletes is a test of single leg balance. So I did this test myself to compare the stability I fell when wearing my new golf inserts compared to the original golf shoe with factory inserts. The first thing I noticed was the immediate stability because of the firm heel cup of the ALINE insert. My foot didn’t waver or wobble one bit as soon as I stepped on 1 foot. I noticed a significant change in my hip stability as well. In other words when I stood on a single leg without the ALINE golf inserts, my heel immediately sunk into the squishy worthless original pad, which caused the compensation in my hips to laterally shift in order to create a new center gravity. You can imagine how this might translate into poor hip control when you’re squaring up for a shot. When you think about your golf stance it’s important to maintain control and alignment throughout each element of your swing. Where I find this test to translate as relevant for golfers is with the finish. During the final moments of your swing when you turn your hips and rely on your leading foot to support 80% of your bodyweight, you are nearly performing a single leg stance. Without the proper support in your footwear, you will inevitably demonstrate compensatory movement patterns in order to stay upright. Regardless of your trunk stability the fact that you’re starting on an unstable surface (grass) put you at a disadvantage from the start. By increasing the stability at your feet, you set yourself up for stability throughout your entire swing, leaving your hips to focus on providing power, instead of working extra to keep you upright. Adding the ALINE golf inserts into my old golf shoes added new life to my shoes. I didn’t realize how uncomfortable and unsupportive my old shoes were until I replaced the insole with the new ALINE golf insole. The 1/4 inch pad that comes in your golf shoe is about as comfortable as standing on a piece of cardboard. One of the biggest the misconception about shoe inserts is that they have to be soft and squishy to provide padding in order for your feet to feel better. That’s simply not true. If your shoe and inserts provides the support and structure your foot needs, a very small amount of padding will do. The problem with most manufacture insoles is that they do not contour to the shape of your foot. As soon as you put on the ALINE golf inserts, you immediately feel the contour around your arch and the support provided by a well-shaped heel cup. This support is especially important if you have heel pain knee hip or back pain. One of the first things I noticed when I added the ALINE golf inserts to my shoes how much better they felt when I walked. I wear ALINE insoles in my walking shoes, so adding the golf insoles to my shoes provided support that I’m used to having when I walk with my every day shoes. When you think about how that translates to your golf game, it means you take out one element of uncertainty or change. Standing in my golf shoes not only provides better support now, but it feels more familiar, which will allow me to concentrate more on the other elements of my swing. The average golfer takes 10,000+ steps during a round of golf walking 18 holes (source). Even riding in a cart will result in 4,000 to 6,000 steps for 18 holes. It’s a shame to take that many steps in shoes that are uncomfortable, or simply don’t provide the support your body needs. If you have back, hip, knee, or heel pain, the steps you take will make a significant impact on your joints, especially if you lack the support at the ground level. 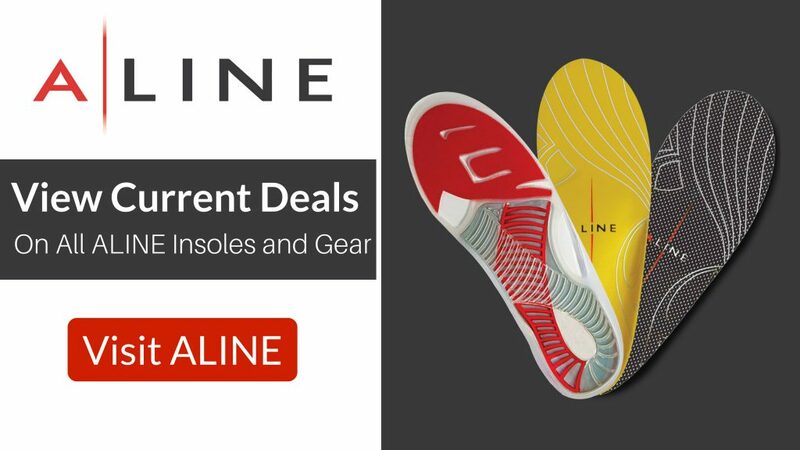 I am still new to wearing the ALINE golf insoles, even though I have been wearing the ALINE active plus insoles for quite a while now. 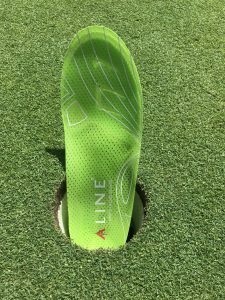 But one of the benefits I can see about having the ALINE golf inserts is the consistency in foot support you will have, even if you were to change your golf shoe completely. 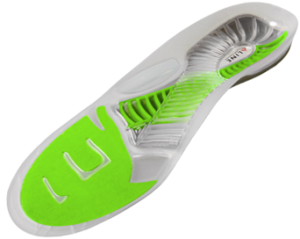 Having a semi-custom removable insert like the ALINE golf insole allows you to have the same consistent support regardless of the brand of shoe you wear. Before you throw out your trusty golf shoes, you might consider adding a comfortable insole to your shoe as a way to extend its life and to give you the support that you ultimately need. I have been wearing the ALINE active plus insoles in my normal walking shoes, so I felt comfortable in adding the golf insoles to my shoes without taking any time to adjust. If you are new to having a semi custom install to your shoe, you might consider wearing the shoe around your house for an hour or two and adding more hours each day for the first week. This will allow you to adjust to the feel of the new insert without making a quick change overnight. To me it absolutely makes sense to have a shoe/insert that provides the support and structure your foot needs in order for you to perform at your highest potential. I was surprised just how much I was compensating because of the lack of support in my original golf shoes. Your body is constantly adapting to small changes in the environment, which includes the support or lack of support that you have in your footwear. When you have back pain, hip pain, knee pain, or foot pain while trying to be active, it can feel like a losing battle. Having the support start at the ground level gives you the best opportunity to move with the correct alignment and movement patterns in order to avoid pain later. One of the first things I talk about with my patients who are suffering from joint pain is the importance of alignment while performing every day motions such as walking, bending, stooping, reaching, and lifting. 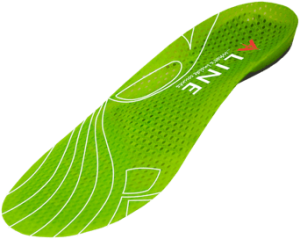 The fundamental principle behind ALINE insoles is focused on good alignment and proper movement patterns. So when I’m asked in the clinic my recommendation on shoe inserts, ALINE continues to rise to the top as one of my most recommended shoe inserts. At $99, they’re not cheap insoles, but you absolutely get what you pay for. You’ll find cheaper insoles out there, but they’ll be just that: cheap. With their 90 day money back guarantee, you can be 100% confident in your new insoles or you can send them back. 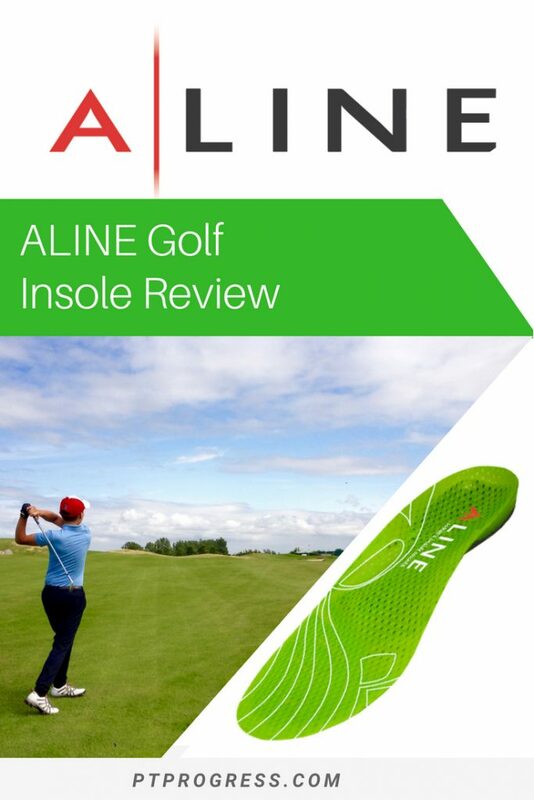 Check out the ALINE Golf Insoles here.